Portsmouth Mayor Kevin E. Johnson and Margaret Kuhn at her 100th Party. Margaret Amelia Victoria Burk Kuhn was born on November 11, 1918, the day that World War I ended, and the reason for the “Victoria” in her name. She was born to Rosa Schmank Burk and Samuel Burk at home in Portsmouth, the second to the last of five children. 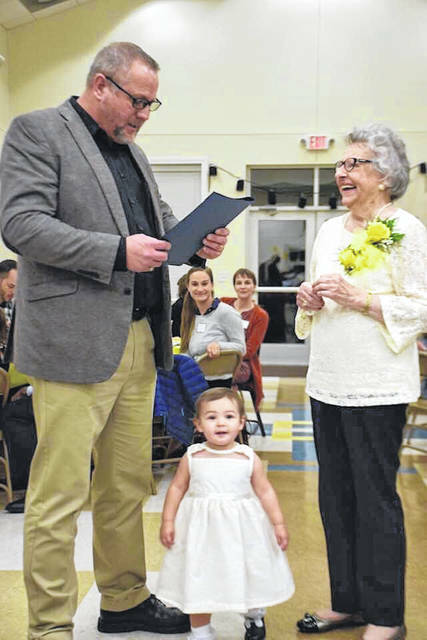 Her life revolved in large part around St. Mary’s Catholic Church, where she was baptized, had her First Communion, her confirmation, and married. She returned to Portsmouth in 1983 after living in many other states, and she continues to be an active member of St. Mary’s, the church that she and her sisters and brothers attended as they were growing up. Fittingly, St. Mary’s was the site of the celebration of Margaret’s life, November 10, and continuing with a big party in the Family Center. 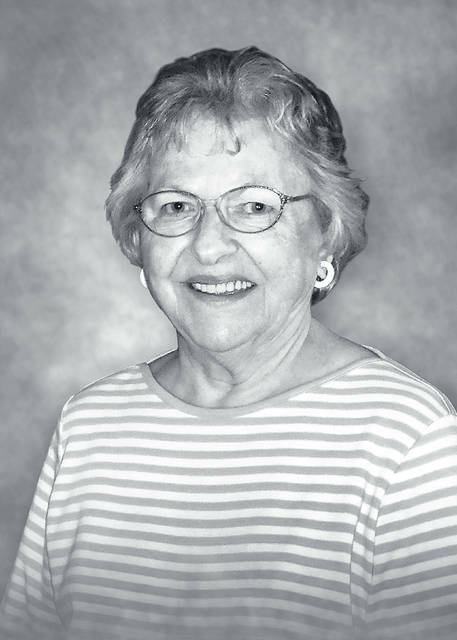 Working at a Schaefer’s Food Market in downtown Portsmouth during high school and Sears after graduation, Margaret met John Kauffman Kuhn, a young assistant manager at the downtown Kresge’s. They married on January 9, 1943. 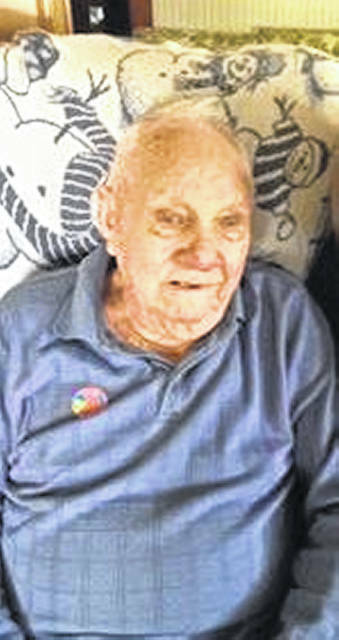 During World War II, John served in the army, becoming a decorated veteran, stayed in the reserves after the war, and retired at the rank of Lieutenant Colonel. Their son David was born during WWII, and Margaret learned how to move households quickly, going to places she had never been to find and set up an apartment or house, learning to cook, and becoming an outstanding homemaker, which she still is today. The Kuhns have five children, four sons and a daughter. David (Canan) lives in Istanbul, Turkey; Mike (Jane) in Albuquerque, N.M.; Steve (Sara) in Signal Mountain, Ten. ; Joe (Roberta) in Richmond, Ca. ; and Tina Welsh (Rick, deceased in 2017) in Lawrenceville, Ga. Margaret has 13 grandchildren and 16 great-grandchildren. Many of these were celebrating her birthday with her at St. Mary’s. Ray was the oldest of eight children born to Charles & Leona Strickland Boldman. on Oct. 2, 1916. They have all passed away except his brother, Charles. Ray has lived in Scioto County all of his life, mostly in McDermott. He worked on the Pearl Overturf farms as a young man, until he went into the Army. He was in the Army from 1941-1945, where he served under Douglas McArthur in the Philippines. He was also in New Guinea. He was first in the 339th Engineers, until he had to undergo a hernia operation. Then, he was transferred to Aviation Engineers, where he built roads, bridges, etc. While serving overseas, he saw lots of death and destruction. But he also saw some funny things. He says that one particular solider in his group, placed his tent far away from all the others. When he would come back after being away from his tent, he noticed it was muddy. One day, he caught the person getting the tent muddy – it was a Japanese soldier. He told the Japanese soldier he didn’t mind him using his tent, but stop getting it muddy! Cigarettes were hard to come by, so Ray’s mother sent him a carton of Camels. The natives were always asking for cigarettes and some of the American soldiers would give them Raleighs. But the natives protested – they wanted the “good Cam-uuuls – not the Raleighs. Who says beggars can’t be choosy! When Ray returned from overseas, he went to work at Taylor Stone Co. in McDermott. He worked there, until they went out of business. He worked a short time in construction, then went to work at Waller Bros. Stone in McDermott where he retired at age 67. Ray married Wanda June Schellenger and together they had a daughter, Rhonda Morkassel of Waverly, and a son, Wayne Boldman of McDermott. Ray also had 2 step sons, William Conley of Pataskala, and Roger Conley of McDermott. Ray says he is doing good (for 102!) He will tell you he has had a good life and that the “man above” has truly blessed his life.